Oh! What's she wearing? What's she wearing? Tell me tell me tell me! In perhaps the most surprising fashion choice of the evening, Helen Hunt hit the Oscar red carpet decked in -- wait for it -- H&M. The Best Supporting Actress nominee was happy to boast to E! 's Ryan Seacrest about the origin of her get-up. 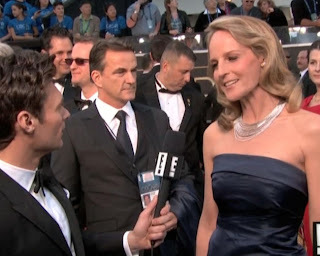 Hunt had eco-friendly reasons for picking the navy gown, explaining she chose H&M because, "they made a beautiful dress and they are going green." The retailer works with Global Green, which Hunt has been collaborating with to fight climate change. In promoting the good cause and wearing something she already owned, Hunt explained, "It's a win, win, win!" Awww...because it gives her a chance to preen about being green! Never let an opportunity to be self-righteous go to waste, I suppose. But the actress didn't walk the carpet without adding a little bit of glam to the H&M frock, accentuating the dress with $700,000 worth of jewelry. That nearly three-quarters of a million worth of ice is there for a reason, folks. It's purpose is to let you know - quite clearly - that while she might don the proletarian fashion, she assuredly is not one of us.